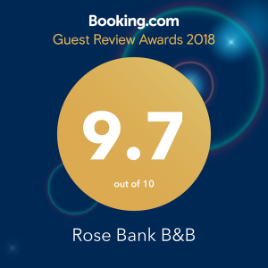 Rose Bank Guest House is a high quality B&B positioned on the high Street of the pretty Exmoor village of Porlock. This highly rated accommodation is a fabulous bed and breakfast destination if you are walking the Coleridge Way, beginning your walk on the South West Coastal Path or just looking for a central location to explore Exmoor or the North Somerset/Devon coast. Situated on the edge of Exmoor National Park, Porlock is a very complete village, offering not only walkers, but all visitors, a wide range of services and facilities. Your hosts are Chris and Sue. → We are delighted to have won LuxLife Magazine B & B of the Year Award 2018 for West Somerset.